There’s no doubt about it. The news of Nyjah leaving his long time shoe sponsor for a spot on the Nike SB team roster took the skate world by surprise. It was one of those things where you weren’t too aware of it, didn’t care too much of it, but when the move happened, it piqued your interest and suddenly you were watching every video posted on his instagram to see the “New Nyjah”. But regardless of his decision to switch shoe sponsors, one thing remains true: Nyjah is one of the gnarliest rail skaters in the game. He drops personal video parts that make you feel like you’re watching a blockbuster action movie, and with the bangers he films, also come the most painful slams. The blood, sweat, and tears he’s put into skateboarding since he was a kid deserves every ounce of respect from fellow skaters and with the topic at hand, deserves his pro model shoe on Nike SB. Hence, we’ve gotten our hands on a pair of the new Nike SB Nyjah Free signature shoe, and after hearing about the technical designs behind the shoe, we couldn’t wait to shred them up. The shoe boasts a sporty look with a running-inspired silhouette, but features a 360-rubber upper that is made to handle all the griptape abuse you can deliver. If you’re a skate shoe nerd, read on below to discover more of the technical designs behind the Nyjah Free and whether or not these features are “marketing gimmicks” or groundbreaking improvements..
Due to its slim construction, the Nike SB Nyjah fits slightly smaller than other Nike SB models. We recommend going a half size up. Also, the shoe features a power stretch bootie construction, which makes it a bit harder to step into, but once you are in, the shoes secure your feet in place. Once the shoes are in your hands and you can feel the rubber upper, you know that immediately that one of the strengths of the Nike SB Nyjah is its durability. The shoes in the pictures posted have been skated intensively for 10 hours. The synthetic upper is vey durably as well as offers a very good flick. To provide additional durability in the high wear areas, another layer of the rubber upper material has been fused around and under the toe box, not visible to the eye. The one piece upper is a highlight, it also reduces the amount of stitching required to hold different layers of the shoe in place; this proactively reduces the points of attack and eliminates the possibility of the threads coming apart. 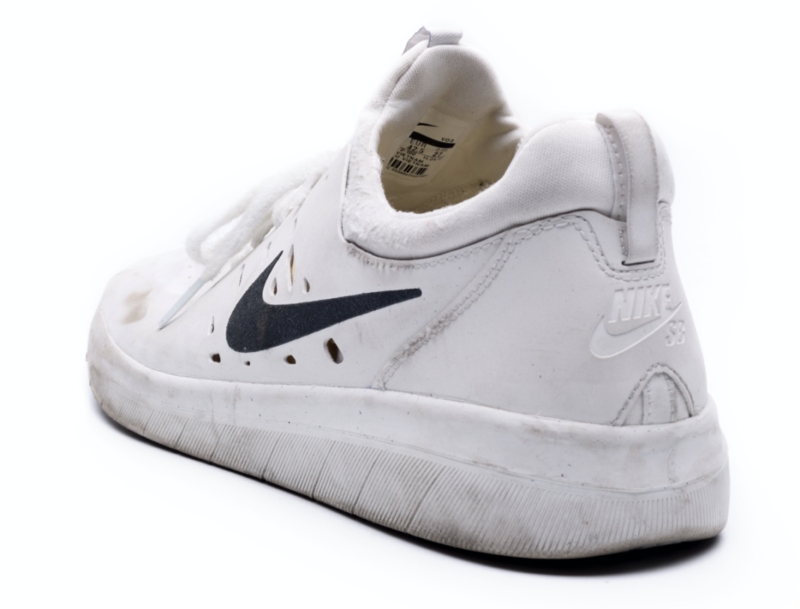 After numerous flip tricks, the sole surrounding the toe box area ripped a bit fast but the synthetic upper served as a second wall of defense and prolonged the lifespan of the shoe immensely. The depth of the sole pattern is fair, judging from the 10 hours weartest, it probably won’t outlast the upper material and will eventually become flat in certain areas. Although the sole being worn out fast will reduce the grip, this is still negligible due to the overall durability. All in all, the Nyjah Free’s 360 rubber upper proved to have very good durability. The shape of Nyjah Free is a slim fitting shoe. The toebox of the Nyjah is long and symmetrical. The construction of the long toe box is quite similar to a Janoski but tapers into a more flat surface than pointy. The padding in the sidewalls of the shoe is minimal and when worn, the Nyjah Free feels very close and secure to the feet. As expected, flex is one of the most characteristic strengths of the Nike Nyjah sole construction. They’ve used the small triangular pattern often found in certain models of the Nike Free sole, and applied it all throughout the Nyjah Free’s sole to create a multi-directional flex pattern. Not to mention, the sides of the sole all feature vertical grooves to enhance this flex. This is quite important when it comes to skateboarding, especially in the forefoot area. Overall, the cushioning of this model is slightly above average and takes medium abuse quite well. Gaps and sets up to 10 stairs were no problem and the impact was well absorbed. The thickest part of the sole is located in the midfoot, which helps to protect you from primo landings. The midsole pans out to be thinner towards the forefoot, to provide better boardfeel, and as expected, turns much thicker in the heel area, with a larger emphasis on cushioning protection. This design benefits the rider without losing any of the board feel of a flat-bedded shoe and helps protect your heels way beyond the lifespan of the shoe. A small detail that was also quite noticeable was the support in the arch of the foot, which helped reduced the foot’s soreness after a long session. The Nike SB Nyjah clearly puts its focus on boardfeel and grip. The geometry of the sole pattern increases the flexibility of the shoe and good flexibility results in good grip. As a result, the grip of the sole is greatly effective due to the flex maximizing the surface area of the sole. This, in combination with its thin sole construction in the toe area, creates a responsive contact between board and shoe. The grip is balanced pretty well; in the beginning it was almost too grippy especially with a new sheet of griptape, but after a few sessions, the grip evened out and was well adapted. A lot of skaters are used to choosing a shoe with traditional suede upper due to its responsive grip and flick, which leaves this rubber upper material of the Nike SB Nyjah quite controversial. But after our personal weartest, we’re backing this the grip of this all around rubber upper: the flick was exceptional. The most important features for a comfortable skate shoe include weight, ventilation and a well-crafted inner shoe area. 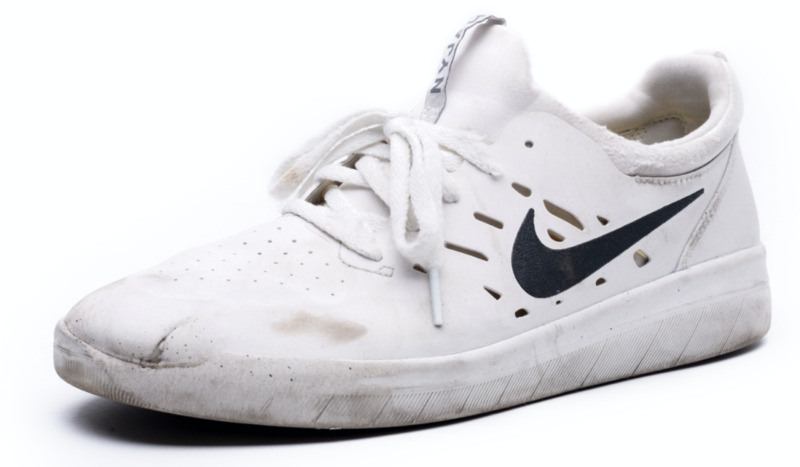 The Nike SB Nyjah Free is lightweight and the inner area is crafted quite well, although some slight pressure marks were noticeable during the first few sessions. Those pressure marks are a direct result of the shoe’s shape and the stability of the synthetic upper. The only disappointment of the Nike SB Nyjah Free is it’s below average breathability. Beside the breathable tongue area and a few holes in the synthetic material, the upper doesn’t offer any other breathable elements. This means warm air and moisture can’t escape the shoe, which already causes warm feet even before being skated in. As far as stability goes, the Nyjah Free features a heel reinforcement, which you can feel by squeezing the sides of the collar together. It keeps the foot in place and prevents horizontal movement within the shoe. The synthetic upper did not stretch out at all during the test. This means the sidewalls won’t get too flexible and lose their shape, and the stability of the shoe should maintain it’s full potential over the whole lifespan of the shoe, which rarely the case with most suede or leather models. Moreover, Nike implemented their patented Flywire technology (also known as Vectran Fibers) into the shoe, which are essentially thin string-like filaments (similar to a bridge’s suspension cables) applied to the shoe’s upper that connect to the shoe’s outsole with the purpose of reducing weight and holding the feet securely in place. Instead of having pieces of different material stitched together to create a stable shoe, these high tensile strength fibers wires act as targeted lines of reinforcement where the shoe really needs it. The designers at Nike know the force loads at certain points of the shoe when it faces strong impacts from jumping down big sets, and strategically placed these fibers to stabilize the feet in a certain methodology to prevent injury. Although the shoe is extremely lightweight and the inner bootie construction allows for a wide range of ankle movement, the shoe still feels very supportive and stable. Despite a lack of breathability, the Nike SB Nyjah Free impressed us with it’s long-lasting durability, outstanding flick, exceptional comfort, and is currently the most innovative skate shoe on the market.